If audiences didn’t quite get enough of the sound of thundering hooves with the release of The Man From Snowy River in 1982, along came We of the Never Never hot on its heels to give them another dose. Shot on Mataranka Station, 172 kilometres from Katherine in the Northern Territory, this production features endless herds of brumbies and cattle and many familiar rugged Aussie faces like John Jarrett, Martin Vaughin and Tony Barry. The main double act, however, is the resonant Arthur Dignam and the glowing Angela Punch McGregor as station owner Aeneas Gunn and his new bride Jeanie. While the men muster livestock on the million acre outback property Jeanie proves herself to be more than just ‘the little Misses’ by falling in love with the landscape and its people. The story is set at the turn of last century and is based on the classic novel by Mrs. Aeneas Gunn who experienced first hand the resistance of stockmen to the presence of a female and the dilemma of reconciling the role of a white woman in a black man’s country. Jeanie’s housemaids go walkabout, her gardener is sung to death and the white men leave black women behind pregnant. Her husband informs her that it all started with the handing out rations of tobacco and sugar or even before, with colonisation. Still, this pioneer woman begins to make inroads by accompanying the women while they gather bush tucker. At least one goanna was harmed during the making of this movie which apparently took its toll on the cast and crew as well. Despite the hardships on and off-screen, the film looks stunning, with opalescent widescreen shots of sunsets and sunrises, thanks to cinematography by Gary Hansen who won an AFI Award for his efforts. The opening credits alone, with a sweeping chopper shot across the endless grass plains where a lone horseman is galloping full throttle, is enough to hook you in and then there’s the beautiful music by Peter Best. 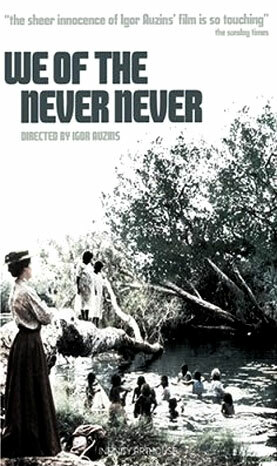 Kids in the past might have lapped up the book but the DVD is a wonderful substitute for them today with extras including ‘Back to the Never Never’ and ‘Walkabout Documentary’.